For those who have had enough seafood for some days, The Barking Dog is there to show you the way to heaven, or at least to some big portions of meat! 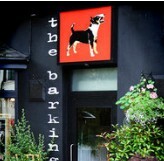 At The Barking Dog you can get delicious steaks, hamburgers, grilled chicken and much more. On the menu you will find fish pie, salmon, cod, smoked haddock, prawns, mussels and other seafood as well, but you can easily skip the seafood in this restaurant and get some real meat food. If you are out shopping in Lisburn Road you can find The Barking Dog only a few blocks away… A good choice for a tasty dinner!